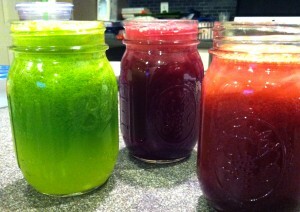 How do you know that you’re going about a juice cleanse the right way? Avoid these rookie mistakes. Before starting a juice cleanse, you need to detox for two weeks. This is called the pre-cleanse phase. The goal is to eliminate processed foods during this time. Not only will this start to change your eating habits, but it will get you in the right mindset for the actual cleanse. 2. Going for it 100% from the very beginning. If this is your first juice cleanse, you’ll end up starving and exhausted if you try to replace all of your meals with juice. Instead, start with just replacing just one meal or snack with juice. After a few weeks, when it becomes part of your regular routine, replace more meals with juice. 3. Doing a cleanse for too long. Your cleanse shouldn’t last for more than three days. Not only are longer cleanses difficult to sustain, but they can make you deficient in important nutrients. If you want to do a cleanse for longer than three days, add in some solid foods. This will help your body to absorb the necessary nutrients. Yes, fruits and vegetables contain water, but you still need to drink a lot of plain water, too. Plus, drinking water will keep hunger at bay between juices. 5. Not mixing up juice ingredients. Yes, kale is great, but any good list of juicing tips would tell you that you need other ingredients in order to get in all the important nutrients. Make sure that you have a good mix of ingredients in your juices. If necessary, pick up a book with sample juices, and play around with the recipes until you find something you like. For a majority of people, a three-day cleanse is fine. However, if you have certain medical issues, a juice cleanse may not be the right choice. Professionals like Yosef Meystel on Tumblr work to keep the healthcare industry reliable, and you should follow the advice of your doctor. If they don’t suggest doing a juice cleanse, find a different way to lose weight. 7. The juice is too high in calories. Even healthy food comes with calories. If you’re drinking too much fruit juice, you could be getting more sugar and calories into your diet than is recommended. Cut back on fruit and replace some of it with veggies. 8. Not adjusting your fitness level. You’re limiting your calories during a cleanse, which means you won’t have the energy to workout like you usually do. For the time being, cut back on your exercise regime. Plenty of celebrities are fans of juice cleanses, but that’s not enough reason to do whatever they recommend. Make sure you speak with a doctor before starting a cleanse.